Allows SMEs and sole traders to take face to face card payments, anytime and anywhere in the UK and offers the fastest settlement on the market. 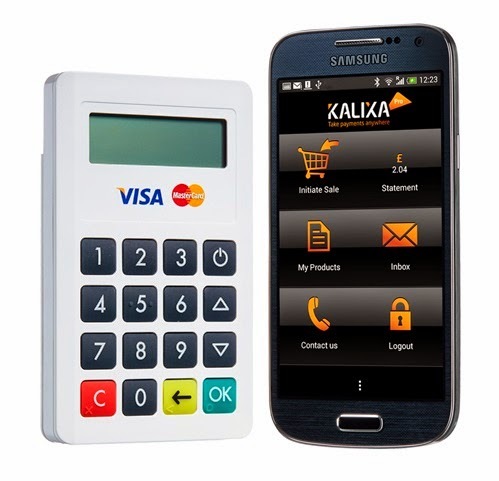 Kalixa Group, a next generation financial technology company, today announced the launch of Kalixa Pro; an mPOS solution, that enables small businesses, sole traders and mobile workers to accept face to face card payments from customers, on their smartphone. Kalixa Pro combines a low, flat rate transaction fee of just 1.99%*** with the fastest settlement on the market to address small businesses’ need to improve cash flow and increase sales. The new Kalixa Pro service is quick and easy to set up and there are no long term annual fees or monthly contract commitment, instead it offers a simple pay as you go service, so businesses can use it as much or as little as they like. Kalixa Pro is unique in that it overcomes the cash flow barrier faced by many small businesses, offering settlement and access to cash within three working days. This is less than half the time of the majority of competitor services that take between 7-10 days to settle payments and typically charge a monthly fee. So whatever your small business, whether you are a mobile hairdresser, B&B owner, plumber, self-employed accountant, café owner or nursery owner, Kalixa Pro allows you to securely take face to face card payments from customers, wherever you are in the UK, to help boost your sales and reduce cash flow issues. The MasterCard and Visa certified solution, combines a FREE, simple to use, mobile app (Android and iOS) with a secure Chip and PIN card reader so users can quickly and securely take card payments with just a few taps on their smartphone. The device accepts secure payments from MasterCard, Visa and Maestro, offering consumers a reliable, convenient and stress-free way to pay, and ensuring small businesses need never miss a sale again or be limited by the cash in a potential customer’s wallet. Kalixa Pro allows small business and sole traders to benefit from a range of additional features including; instant updates on incoming payments as and when they happen, allowing users to keep a close eye on their finances. Merchants can also use the app to provide customers with discounts, refunds, email receipts and reduced transaction times to provide an improved customer experience and as sensitive data is never stored on merchants mobile device both customer and trader can be confident that the solution is completely secure. Independent research** carried out on behalf of Kalixa Pro shows that 45% of micro-businesses feel that cash flow is the biggest barrier to growth for their business. The research also suggests that in the UK alone up to 65-70% of micro businesses in the UK do not currently accept debit or credit card payments and approximately 423,000 businesses recognise they are missing out on sales as a result. Colin Swain, Global Head of Product at Kalixa Group, commented: “The UK’s sole traders and small businesses are getting a rough deal from banks today to take card payment; with high prices, poor service and delayed settlement leading to real problems with cash flow. As a result they’re not accepting cards and are missing out on sales. We listened to what small businesses need and have launched Kalixa Pro, which will provide these businesses with a game changing payment service designed to help solve the cash flow challenge and enable increased sales. Finally there is a service on the market that makes it commercially feasible for small businesses to offer their customers a face to face card payment facility, wherever their business takes them. “The benefits of the product are threefold; firstly it gives customers another way to pay, so they’ll buy more readily, thereby enabling small businesses to increase their revenues. In addition it will reduce the amount of time that tradespeople spend chasing up late payments and it allows sole traders and small businesses to portray a more professional image and provide a better service to their customers. “Sole traders and small businesses are the lifeblood of the UK and as such Kalixa is committed to supporting the growth of this vital part of the UK economy by providing an integrated service that takes care of all their payment needs.” concluded Swain. Small businesses and sole traders can order online at www.kalixa.com/pro. For a one off fee of £59.99 +VAT the reader will be sent out FREE via next day delivery* so once the mobile app is downloaded, users can be up and running, receiving secure mobile payments on the move usually the very next business day. **Kalixa commissioned research into micro business in 2014. Research was carried out by mobile squared.